Fourth Row Center: Film Writings by Jason Bailey: In Theaters: "The Assault"
Julien Leclercq's The Assault, with its bleached-out color scheme and you-are-there handheld recreation of a real event, is just asking for comparisons to Paul Greengrass's Bloody Sunday and (especially) United 93. It doesn't hold up well under that rubric; the film is slick and professional, but doesn't pack the visceral intensity and sheer emotional power of those works. But it has its moments. The French-language film depicts the true story of the Christmas 1994 hijacking of Air France Flight 8969 by four terrorists from the GIA. They took over the flight before it left the ground in Algiers; their intention, it is believed, was to fly the plane into the Eiffel Tower (shades of 9/11). But they spent so long on the runway in Algiers that they had to stop in Marseilles to refuel; there, the GIGN (French SWAT, basically) stormed the plane. Admirably, the film doesn't beat us over the head with too much exposition; the plot is set into motion by the hijackers' wordless preparations, and the strategizing on the ground is done conversationally rather than didactically. Leclercq deftly intercuts between the plane on the runway in Algiers and French authorities trying to think a few steps ahead of the hijackers--particluarly Carole (Mélanie Bernier), who becomes convinced that it is a suicide mission. 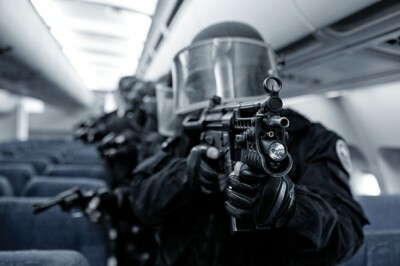 The decision to let these scenes function on tension and expectation rather than overblown, false action is admirable, but they put a bit of a drag on the second act; there are, it seems, endless scenes of hijackers pacing up and down the aisles, shouting "Allahu Akbar" and dragging passengers to the door for execution. The film attempts to establish a hero in Thierry (Vincent Elbaz), and almost pulls it off; Elbaz is a fine actor, but the script doesn't give him much to play. Likewise, there's no real sense of the hijackers' personalities; they're basically interchangeable. However, as the picture reaches it's third act, Leclercq's methodology becomes a little more clear. Much of it was, it seems, a nice slow build to the titular event: the GIGIN's assault on the plane. The film pulls taut as the GIGN officers get into position; Carole, listening in to the signal from the cockpit radio, hears the terrorists and her eyes widen. "That's the Death Prayer," she says, urgently. "You have to act now." The shoot-out has a thudding, disconcerting inevitability--it's not thrilling (not in any conventional sense, anyway), but it is bluntly effective. I've occasionally taken in foreign action films at film festivals that seemed to be there only by virtue of being subtitled (and by the way, distributors: yellow subtitles, please); had they been made in America, they'd just be another action movie. But this climactic sequence spotlights the differences between French and American cinema. In stark contrast to the rah-rah of most American action pictures, this one is mournful and wrenching, the music little more than a single-chord dirge. As a result, the scene is troublesome, and rather haunting. The Assault ends beautifully. It's just that it's a bit of a haul to get there. "The Assault" opens today in limited release.